Producing quality Scottish porridge oats since 1888. 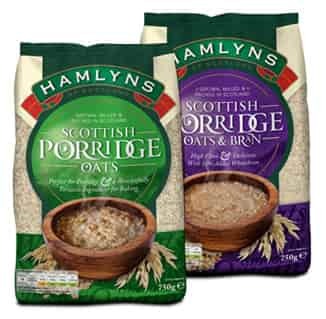 Hamlyns of Scotland is part of a family food business which started milling oats in 1888, so we like to think that we know a thing or two about oats. Our traditional range of Scottish Porridge Oats and Scottish Oatmeal is produced from premium Scottish oats, grown and milled in Scotland – 100% Scottish from seed to mill to finished product. Lovely light muffins with apple, lemon and spice. Our traditional range of Scottish Porridge Oats and Oatmeal are 100% natural with no added sugar, salt or additives. Eating oats and oatmeal can benefit your health in many ways, which is why health professionals recommend them as part of a healthy diet. Oatmeal and porridge oats are two of the few wholegrain foods that come out of the package as 100 percent whole grain. Oats have a high content of complex carbohydrates and soluble fibre, which means they release their energy slowly. Our traditional range of porridge oats and oatmeal are 100% natural with no added sugar, salt or additives.